KAC 6 x 35mm PDW (Personal Defense Weapon) Caliber: 6 x 35mm Weight Empty: 4,5 lbs. Magazine Capacity: 30-rounds (20-rd available) Length Overall: 28 Length Folded: 19,5 Barrel Lengths: 10 & 8 Muzzle Velocity: 2,425 fps (10 barrel) KAC Introduces 6mm PDW for Special Operations Applications Posted on Wednesday, May 24 by David Crane, david at defensereview.com Knight's Armament Company (KAC) has just (formally) introduced a 6mm (6x35mm) PDW (Personal Defense Weapon) with AR-15/M16 controls for the Mil/LE market (tentatively) called the "CQB" that looks like it would be ideal for CQB/CQC (Close Quarters Battle/Close Quarters Combat) and military PSD (Personal Security Detail/Personal Security Detachment)/Executive Protection applications, including vehicle-borne operations. The new weapon was formally introduced at the NDIA Small Arms Symposium in Albuquerque, New Mexico. However, that's not the first time the new weapon/ammo package was shown. A KAC official actually showed DefenseReview a prototype CQB PDW confidentially at SHOT Show 2006 in Las Vegas back in February on the condition that we would not discuss or write about the new weapon. This was tough on us, since this weapon system is hands-down the single most interesting and intriguing item DefRev saw and handled at the show. Because of the secrecy involved, I jokingly came up with the code name "The Gadget" (referring to the prototype weapon) while talking with KAC officials at their booth, a nod to the Manhattan Project (atomic bomb project during WWII). By the way, "The Gadget" weighs 4.5 lbs (4 lbs, 8 oz.). Defense Review was told that the KAC 6x35mm PDW cartridge weighs approx. 65 grains and yields 848 ft.-lbs of muzzle energy at 2425 fps out of the CQB's 10-inch barrel vs. 5.56x45mm M855 ball's reported 776 ft.-lbs of energy (unconfirmed/unverified) out of an equivalent-length (10") barreled M4/M4A1 CQB subcarbine/SBR (Short-Barreled Rifle). Even though the muzzle energy generated is higher, KAC claims that the CQB generates 40% less recoil compared to a 5.56mm AR-15/M16 subcarbine/SBR. To give an idea of how the KAC CQB PDW/6x35mm cartridge combo stacks up against other PDW/ammo packages, it's been reported to DefenseReview that the standard FNH SS190 5.7x28mm round creates 390 ft-lbs out of a FNH P90 Submachine Gun/PDW (reported 10.2" barrel), and the standard HK Defense 4.6x30mm round creates 310 ft-lbs out of the HK MP7A1 PDW (7" barrel). When asked about the CQB's combat/lethality envelope, a KAC official told Defense Review that the CQB/6x35mm package is accurate and lethal out to 300 meters. The CQB will deliver sub-2" MOA. 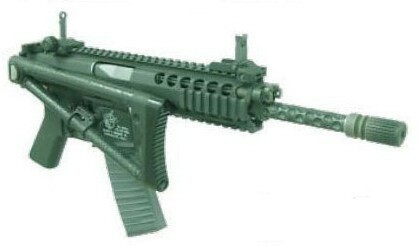 The KAC CQB PDW is utilizes a dual-piston system and is gas-operated. The recoil spring runs the full length of the upper receiver, right up the middle between the two gas pistons. Bolt system is AKM/Kalashnikov style. The CQB utilizes a monolithic upper receiver and full-curve magazine. The barrel has been lightened with a patented dimpling process, which gives the barrel an interesting look. According to the KAC company official we spoke with, KAC basically pulled out all the stops in creating the CQB, and the per-unit cost is likely to reflect that. "It's like an F1 race car. We busted out all the tricks on this weapon to get the performance that we've gotten. We really pushed the limits, so that aspect's gonna' be a cost driver," the official told us. When I handled the CQB at SHOT Show, I immediately felt a very wide grin forming on my face. While the gun felt somewhat toy-like because of its light weight and balance, it also exuded high quality. Unfortunately, we weren't able to get the weapon to the range. Until we can do that, we can't endorse it--but we can certainly report on it. DefenseReview will say this: Due to it's 6mm cartridge, the KAC CQB PDW would appear to be the most lethal personal defense weapon (PDW) system that's been fully-developed to date. The only possible exception to this that DefRev is aware of is the Saab Bofors CBJ-MS PDW, which utilizes a 6.5x25mm cartridge called the 6.5x25mm CBJ. It should be noted that the CBJ-MS PDW is more Uzi subgun-like (in appearance and ergonomics) and doesn't offer AR-15/M16 controls. It will be interesting to see how the CQB/6x35mm and CBJ-MS/6.5x25mm packages stack up against each other in terms of muzzle energy and terminal ballistics/lethality. Without testing them, the CQB would appear to have the edge, since it's first PDW we've seen that appears to be able to outperform 5.56x45mm short-barreled weapon with an equivalent-length (10") barrel (unconfirmed/unverified) with regard to muzzle energy. If this is the case, and the CQB PDW lives up to the hype, it may constitute revolutionary performance from a PDW weapon/ammo package. We'll see. DefRev can't wait to get this one to the range. It's a very cool gun. Knight's Armament Co. (KAC) can be contacted by phone at 321-607-9900 By fax at 321-268-1498, By email at info@knightarmco.com.